You could make the argument that, before Sunday, Roisin Willis was still trying to figure out who she was as a track and field athlete. To be fair, in previous months she had shown promise on all three levels. This past fall she had a very good cross country season, finishing fourth at Wisconsin's state meet while also netting a personal PR of 17:48.00 for 5K. As an eighth grader, she had logged a 100m best of 13.07 seconds, 26.11 in the 200m and 56.78 in the 400m over the outdoor track season. She even broke 2:10 in the 800m and 5-minutes in the mile. But major signs were starting to show in December. 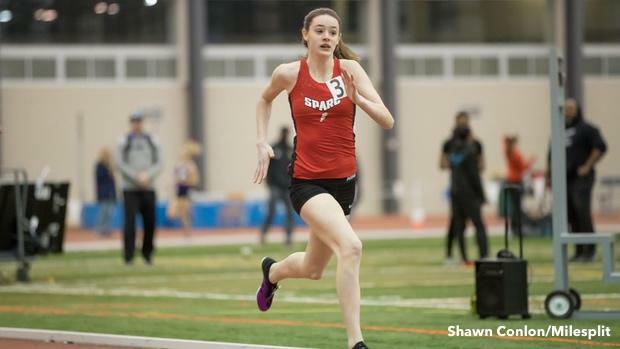 The Stevens Point High School freshman doubled up for two big-time races in the 800m (2:09.57) and the 1600m (4:56.80) at the Michigan Indoor Track Series' first race at Grand Valley State University. And by any measure, her performances on that day were eye-opening. Both efforts landed her US No. 1 marks for her grade, and that 2:09.57 was a US No. 1 time. But in some respects, it was also just one performance. Could she do it again? On Sunday, Willis certainly did, logging the eighth fastest girls 800m time in February history, going 2:06.91 at the MileSplit/SPIRE Scholastic Showcase. It was also the fastest freshman time in February, and was just 0.43 seconds off the freshman class record of 2:06.48, which was set by Devon Williams of Towson Catholic in 2004. If there was any question where Willis' future lied, few remained after her finish at the SPIRE facility in Geneva, Ohio. Willis, who largely has featured on oversized 300m tracks, is now one of just five freshman girls athletes since 2000 to have broken 2:10 in the 800m indoors. And that list isn't too shabby, either: Michaela Rose (2017), Gabrielle Wilkinson (2015), Mary Cain (2011) and Devon Williams (2004). Two athletes not on that list, Athing Mu (2:10.61) and Ajee Wilson (2:10.45), led their respective freshman classes in previous years, though neither broke 2:10. Year over year, Willis has also turned the corner. She's cut a remarkable 10 seconds off her indoor PR in the 800m from 2018 (2:16.08) and is approximately nine seconds faster in the 1600m. Across the board, she's also faster in the 55m, 200m and 400m. Keep an eye on Willis to finish out the season, and on toward the spring season. She's likely only touched the surface in regards to talent and ceiling.